Which car is better Ford or Mercedes for Travelers? If I were traveling by car around the USA, I would want a Ford. If I was traveling by car around Europe, I would like a Mercedes. If I was traveling by car around Africa, maybe a Renault. I would choose a car that I could be repaired easily. A computer is the same; I chose my Hewlett Packard PC computer because I can have warranty or maintenance work done easy. I want to be part of the crowd; I do not want my computer to be unique. I see PC computers daily, I rarely see a Mac computer, just that fact alone makes up my mind, and it is scary to think about Macs. I have never seen an internet café full of Macs in 10 years of perpetual travel. Are Macs and PC compatible, can I interchange software programs? I do not know, and truthfully I do not care, just is not important to me, however if you have coworkers this may be important. All the programs I use my laptop are compatible with the computer in the local internet café here in Pucallpa, Peru where I am presently located? 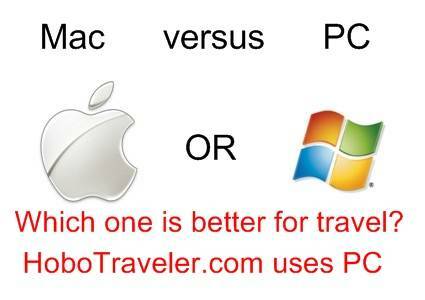 Are all the programs for Mac compatible with the PC computers in the internet cafes here in Peru? The cost of having WIFI internet in my room doubles or triples the cost of rooms. If the Mac user needs an internet connection to be compatible, he or she is going to pay more for rooms. I have a business, I pay about 10-15 dollars per day for internet in my room, if I did not need an internet connection, then I would be paying five. In addition, you are not going to take your car to Africa. Buy what you like, and be happy.